Once the waves of tiredness and euphoria of the first day or two after a marathon subside, this is the question that invariably presents itself to runners. The answer might be to tweak training to eradicate the weaknesses exposed over 26.2 miles, it's frequently the booking of an event for next autumn/spring and sometimes it's the decision to look at challenges away from running for a while. I'm no different, and after a week of pawing over Garmin data and previous training plans I think I know my answer. That is to say I think I've refined my answers, as Amsterdam was already booked and I'd taken the decision several weeks ago not to view Paris as an end in itself but as a milestone on a longer journey. I've got 27 weeks, including last week, until The 'Dam. I know what I'll be doing for the last 18 of those as that will be the Pfitzinger & Douglas 70 miles a week plan. It's what I'd do before that that was most loosely formed in my mind. Initially I'd thought of having 2 full weeks off from running but the need to be doing 55 miles, running 6 days a week, in 8 weeks time makes that a problematic approach. The initial rest might be beneficial but it would make the ramp up steeper further down the line. As a result, I decided to build from P&D's 5 week recovery plan, but with a week off beforehand and 3 further weeks of building at the end. I'm hoping that from a running perspective that will allow a number of easy weeks (compared to what came before) but will have me in reasonable shape for starting a tougher marathon training plan afterwards and in terms of running that's it. No speedwork, no runs longer than 15 miles, all fairly regulation stuff and all quite deliberate as, learning from the last 20 weeks, I want running to step out of the limelight for a bit. Through the Paris training I was so focused on my mileage that I did very little in the way of strengthening, core work or even stretching. It was so easy to skip session after session after session, and I'm sure that had I incorporated these it would have been beneficial for the 26.2 miler, and by beneficial I mean faster! That's 17 sessions a week on top of the running. Whilst they're all pretty short that's still a large number and that's why I want this to have greater priority in my mind than the running, which I'm regarding as something that will just happen as routine. On a similar theme my weight wasn't where I'd initially planned for Paris. I was able to lose weight for a week or two but couldn't keep it going. In part that's because, again, mileage was the dominant objective but it also reflects greater difficulty in maintaining calorie deficit when mileage was high. So, maintaining a deficit while mileage is low in the next 8 weeks is my other big objective. In that way I expect to finally get to 11st by the time marathon training starts. If I drop a pound or two after then I'll be delighted but at this stage that's not something I'll be deliberately setting out to achieve. To summarise, I'm looking to use the next 8 weeks to allow full recovery from Paris whilst gradually getting me into the best shape possible for (and to allow focus on) the Amsterdam training that follows. In terms of my aim in Amsterdam, at the moment I'm just saying sub 3:15, but in the same way that Paris started at sub 3:30 and became sub 3:25 I have half an eye on something lower but that is absolutely dependant on weight loss success. The late Max Jones had a formula for predicting marathon times that proved shockingly accurate (to within one minute) for Paris. Makes me wonder what more I could do? ...and quite satisfied with how things went. The pre marathon taper held a few of it's usual trials and tribulations. With 2 weeks to go I was scheduled to run a race of about 5 miles on the Saturday but the race choice was limited to a park run so instead I did a 5 mile 'time trial' on my own, covering the distance in 33:50. The next day though I struggled on a 16 mile run with very tight hip flexors on the right. A trip to the physio found tightness in HFs as well as adductors - probably as a result of almost completely neglecting strength, core and stretching throughout training and the speed training exposing it. Took it easy as a result, dropping the last speed session as well as one run in the final week. Carb loading was its usual challenge of bloating and discomfort and on the Saturday afternoon I was convinced I was coming down with a virus. Ironically though, that night was the first time I got anything close to a decent night's sleep for some time. Weight loss didn't work out as planned either in training or taper and I tipped the scales a stone over where I'd wanted to be and 5lbs heavier than Paris last year. The forecast for the marathon was for it to be mercifully cool at 6c but there were northerly winds of 21mph gusting to 49mph also forecast, and whilst most of the route would be sheltered from these the last 6.2 miles would be in park land largely straight into the headwind. As a result I invested in a pair of Gore arm warmers at the expo! It was extremely cold waiting for the start, not helped by the new starting process for this year. The normal approach has been for time based pens but this year these were also split into left and right with each half being started on a random pattern. Unfortunately that meant a 12 minute delay before starting (as I picked the wrong half) rather than last year's 4 minutes. The approach was designed to reduce congestion but I found the opposite to be the case as there were far more runners to pass. That meant that at half way I was feeling really good and if anything was having to hold myself back so that adrenaline didn't prompt me to abandon the discipline of the plan too much. Not sure why I dropped a few seconds in that section. The two 7:50s included water stations, and that area was very sheltered and briefly sunny meaning I felt a fair bit warmer but overall I suspect it was a mix of fatigue starting to kick in alongside realisation that I was comfortably ahead of schedule overall. At 20 miles I was averaging 7:43 a mile - the average having slowed by 1s a mile since halfway. So, that was the first part of the plan done and dusted. No water station to mark that mile - I think it was more a case of my allowing myself to slow but still be 7s ahead of the new target, particularly as I realised I had 40s extra banked from the quicker first 20. Over confidence, running into the wind and a drinks station all slowed me down but it was a bit of a wake up call and I decided I needed to maintain focus rather more. This was getting tough though as at 20 miles I was starting to get some ITB pain and this had widened to engulf my quads which were incredibly painful from mile 22. Looking at the data afterwards it looks like tightness shortened my stride but I automatically upped the cadence to over 180 spm to partially offset it. Better, much better. Higher cadence and a conscious effort to breathe more deeply even though it was my legs that were the challenge rather than heart or lungs. Held the pace ok and stayed focused. Back to the first 20 target pace so obviously still working well. I've since wondered whether I could have stuck to this sort of pace after 20 and whether the revised target became a justification to allow some pace drift? Really don't know what happened there. 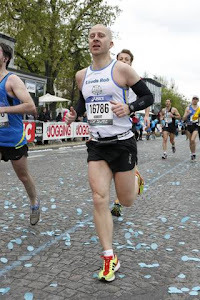 Certainly I was tiring and for the first time I found myself mentally 'looking' for the finish. I don't recall the wind being any stronger but I do remember other runners were becoming increasingly unpredictable in terms of blocking my way or running erratic lines. Mainly though I presume I knew by this stage that I was 'there' and simply lost a little discipline. 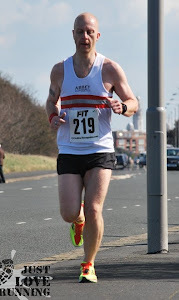 The staggered start meant a good number of runners to pass (about 1500 passed net) and that contributed to my running over distance: 26.34 rather than 26.20 and by the latter stages I was struggling to mentally factor that in. 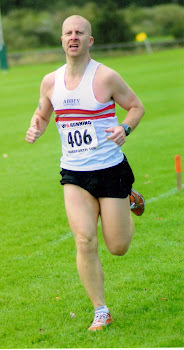 The 250m to go mark also took me by surprise meaning I hadn't 'wound up' the pace in the last full mile. As I tried to lift the pace in that last short section I didn't feel there was much there but the last 0.34 miles were covered at 7:01 pace so I must have had something left. That meant I finished in 3:24:39. A perfect 'Ronseal' plan and strategy: they did exactly what they said on the tin. That's why I describe myself as satisfied rather than elated, but that's not to be mistaken for disappointment. Elation would have been if I'd pressed on to run sub 3:23 but this one was just nicely executed. Pawing over Garmin stats afterwards shows me that heart rate stayed fairly low so my CV fitness would have let me do more. For Amsterdam I need to drop the blubber and show a bit more discipline with leg and core strengthening. Do that, as well as run a few more miles each week and I'm confident of getting under 3:15 but for now there's no running planned until next week at the earliest!